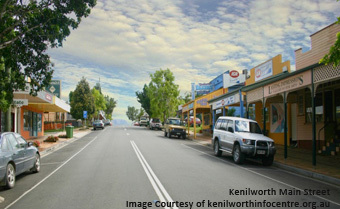 Kenilworth is a small community situated in the beautiful upper Mary Valley, behind the scenic Blackall Ranges. With a population less than 300, the township retains much of its 1920s atmosphere with colonial style houses, a range of local stores, art galleries, the Kenilworth Cheese Factory and an engaging historical museum. In the surrounding State Forest there are excellent opportunities for camping, horse riding, bush walking, fishing and kayaking. Kenilworth is a wonderful, quiet break-away from the hustle and bustle of everyday life, that's close enough for a weekend but far enough to be an escape. 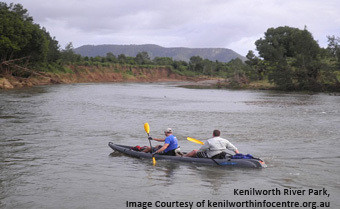 Situated behind the scenic Blackall Range, Kenilworth is a quiet town with plenty of state forest suitable for camping in. If roughing it is not really your thing, there are several apartments, caravan parks and rainforest retreats available in nearby Mapleton. Choose from luxurious, self-contained cabins and apartments that offer stunning rainforest views and friendly service. Some of these places even have wood fireplaces and heated spas for the cool winters, and outdoor swimming pools for the warm summers. From the east end of Charles Street you’ll find Kenilworth River Park, a scenic area that surrounds the Mary River. The grassy banks of the river are popular for picnics while many like to take kayaks and canoes out onto the calm waters to paddle up and down the river. 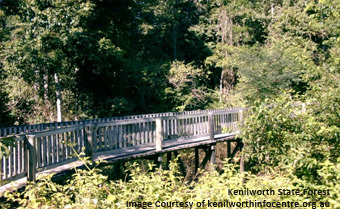 Just 4km south of Kenilworth is the beautiful Fig Tree Walk; a short 750 metre elevated boardwalk circuit. Starting at Little Yabba Creek, the walk takes you through the magnificent Moreton Bay Fig trees, some of which have been growing for well over a century. With stable railings and a smooth path, the walk is child friendly and offers easy wheelchair access. From this area there are plenty of other walks through the State Forest that can suit any one from beginner to the most avid hiker. In particular, the Gold Mine walking track is popular for its delving into the rainforest and the dozens of other tracks that branch off from it. Established in the 1950s as a cheese factory for the Kraft Corporation, today Kenilworth Country Foods makes delicious hand crafted cheeses of superior taste, texture and quality and natural yoghurts. Visitors are welcome to take a tour of the cheese factory, watch the production from the viewing platform and enjoy a free tasting of the latest made cheeses. The Kenilworth Historical Museum is home to some of the local history and has a number of “living history” displays where you can see scenes of colonial life made up of original furniture, tools and clothing. Everything in the displays has a story and the guides are more than happy to share these stories with visitors. The museum is a wonderful step into the past for the whole family. Established in 1986, the Lasting Impressions Gallery has over the last two decades earned a reputation as one of the state’s leading art galleries. Take a look through the contemporary and traditional artwork from some of Australia’s best artists. There are a number of quaint little tea houses, cafes and restaurants in Kenilworth, serving good food with a friendly smile. We’ve listed a few of the better known ones below, but there’s nothing stopping you from simply going for a wonder to see what you find yourself. Just south of Kenilworth, nestled in the bush is the Bellbird Creek Café, a café style Tea House that serves organic coffee, local organic teas and a range of home style cooked meals. While eating here you’re likely to see several Bellbirds from which the café got its name, as well as wallabies, king parrots, water birds and plenty of other wildlife. Right in the heart of the town you’ll find the Kenilworth Hotel, your typical local country pub. The menu is sourced from as much of the local fresh produce as possible and has a regular specials board for what’s in season. Enjoy a drink and pub meal here and meet some of the locals out on the deck. 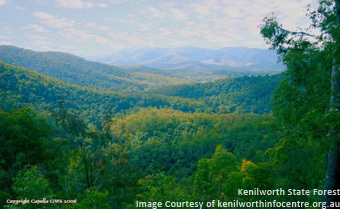 Kenilworth is only an hour and a half drive north of Brisbane. From the Bruce Highway take the Landsborough turnoff and carry on through Landsborough, Maleny and Conondale to Kenilworth. 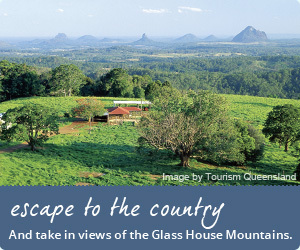 It will take you about an hour from the Bruce Highway but the road is very scenic and well worth it.